Horizon is committed to our nations’ veterans and their families. Today, we wanted to share some exciting things that are happening at Horizon. MODERN WARRIOR LIVE performed for residents and staff on November 9th at the Horizon Village Campus! Horizon Village Campus was excited to bring Modern Warrior Live to the campus for all residents and employees to experience! 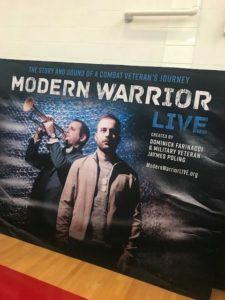 The mission of Modern Warrior Live is to build bridges between veteran and civilian communities through live performances. This theatrical music experience explores the psychological weights of war, the challenges of reintegration as a civilian and the potential for positive personal and communal growth. Horizon is so proud of our intern Jessica who took the initiative to set up a fundraiser for Freedom Village patients for Veterans Day. Freedom Village is located on the beautiful Horizon Village campus in Sanborn, NY. Our program provides intensive substance use disorder treatment to men who have served in the military and/or as first responders, incorporating specialized individual and family services for those who also may have post-traumatic stress disorder (PTSD) or mental health disorders. Jessica collected toiletries, hats, gloves, socks, and underwear. 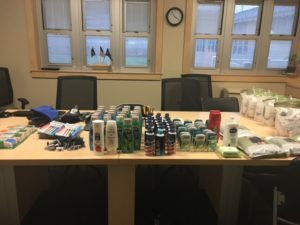 The patients picked out what they needed and the rest went into the donation closet. The patients were so excited and grateful. She has a fundraiser planned for the holidays as well!